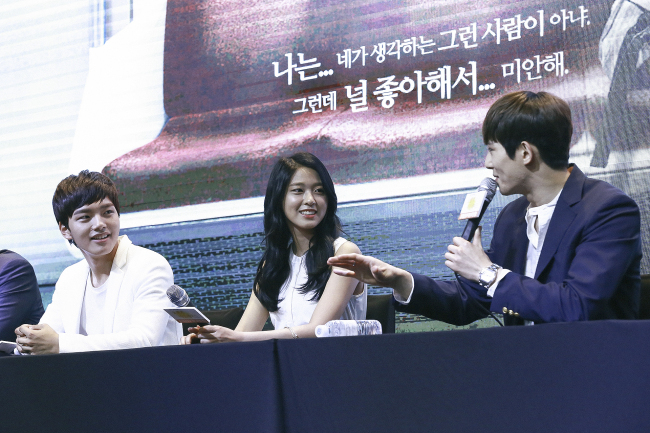 The show, an adaptation of the eponymous Web cartoon, premiered on Friday with a strong hallyu cast featuring Yeo Jin-goo, AOA’s Seolhyun and CNBLUE’s Lee Jong-hyun as the leads. “It wasn’t an easy decision to take the role,” Yeo admitted during a press event at the GLAD Hotel in Yeongdeungpo-gu on Tuesday. He plays Jung Jae-min, a smart, handsome and athletic high school student. “I didn’t know if I could do it, but I didn’t want to miss an opportunity to play a character like this. I wanted to show off Jung Jae-min,” he added. Star student Jae-min seems to have it all, but he always holds himself back ― until he meets Ma-ri (Seolhyun), a mysterious transfer student. Meanwhile, Lee plays Si-hoo, another vampire who warns Jae-min and Ma-ri to stay away from each other. “He’s not weak, but he represents the minority in society,” said Lee. The drama is designed to air as three separate seasons set in the past, present and future. The first season takes place in the present at a high school; the second season will be set 400 years ago in Joseon-era Korea; while the third season will start six months after the time period of the first season. The complex timeline structure is just one of several elements that sets “Orange Marmalade” apart from other vampire dramas such as “Blood,” according to chief producer Kim Jung-hwan. “Other vampire shows had romance as well, but ‘Orange Marmalade’ shows a very young, sweet kind of love, and how vampires can overcome discrimination against them through love,” he said. Throughout the filming, they were careful not to let the drama devolve into yet another vampire cliche, particularly with the nonhuman characters. “I told myself that vampires’ instincts and desires were similar to those that people feel, and talked often with the director about how to make my character more natural, not overdo it,” said Lee. The 12-part series “Orange Marmalade” airs every Friday at 10:35 p.m. on KBS 2TV.